A few weeks ago I got to go on one of the coolest tours ever- a back room tour of Edge of the Cedars State Park Museum! If you follow my blog, you’ll remember the trip out to Arch Canyon Overlook and Cave Tower Ruins with Four Corners Adventures that I organized for our county visitor center staff back in November… I’ve been wanting to make these familiarization tours a regular thing for quite a while now, and so for our second outing I contacted Chris Hanson, the director of Edge of the Cedars, who put me in touch with Jonathan Till, the curator of collections, who was extremely accommodating and more than happy to take our group on a tour of their repository. Edge of the Cedars is made up of three parts; the museum, the archaeological site out behind the museum, and the federal repository. 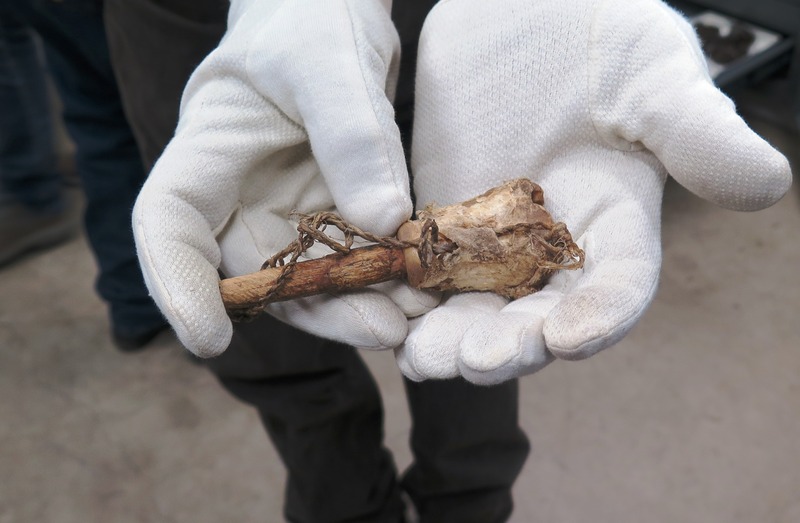 The museum and the ruins are open to the public, but the repository is not, so it was a HUGE treat for all of us to have the opportunity to go behind the scenes and see some of the artifacts that aren’t on display to the public. When the time came to start the tour, since space in the back rooms is limited, Jonathan had us break into two groups. While the first group was taking their tour, the rest of us who would be on the second tour were free to explore the museum and archaeological site out back. 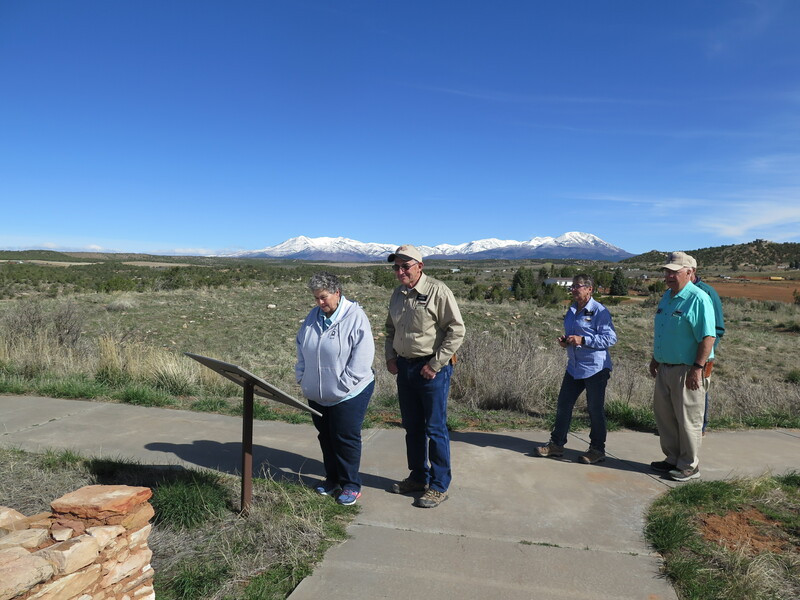 Since the visitor centers are a huge contact point with visitors to our area, my main goal for these outings is to provide opportunities for the staff to get out in the field and become familiarized with San Juan County. I know that most everyone gets out on their own, but for those who are newer to the area, or maybe haven’t visited some of these places in a long time, hopefully these outings will help! 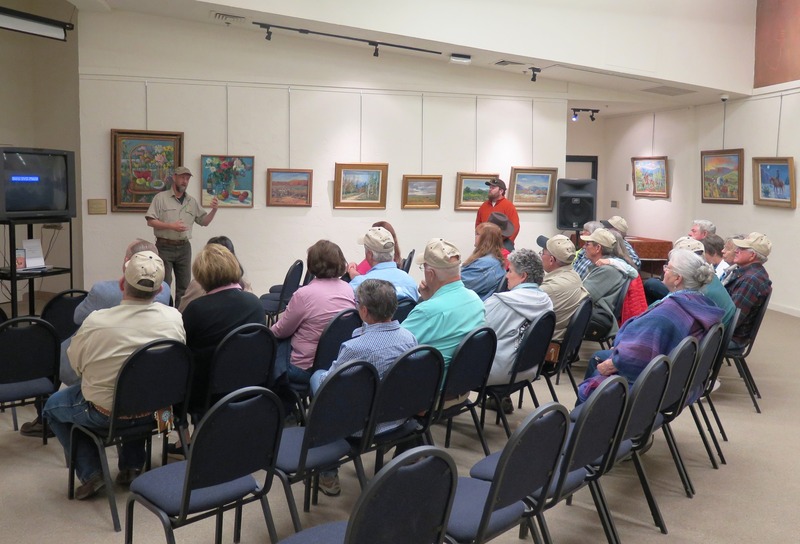 My other motivation for these outings, and the reason I’ve limited it to our visitor center staff, is to provide the opportunity for them to get to know each other and build relationships with the staff members at other visitor centers. I think it’s important for all of us to know each other so that we can reach out when something comes up. And I feel like this is exactly what we had the chance to do while the first group was on their tour- get to know each other a little as we explored the museum together. When it was finally our turn, we excitedly followed Jonathan into the back of the museum. He gave us the run-down on how the museum is set up before leading us into the ‘Sensitive Collection’ room. 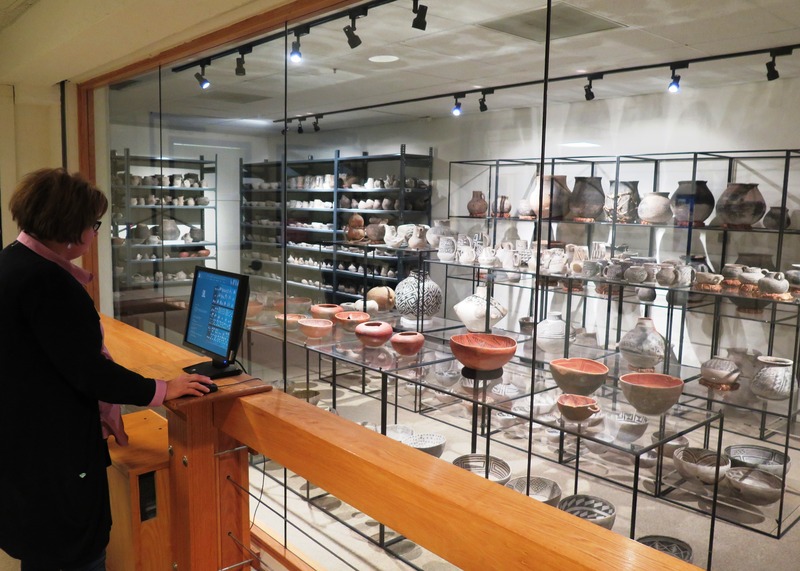 The room was filled with shelves and cabinets, and as Jonathan started opening drawers and we started to catch glimpses of all the artifacts inside, it definitely hit me that this was a really amazing experience, and I felt extremely fortunate to be there! Jonathan showed us so many amazing artifacts, I don’t even know where to start! One of my favorites was definitely the Beaver Tail Rattle in the photo above. I had actually seen it once before- in 2011 my husband and I attended an evening program at Edge of the Cedars called, ‘Back Room Perishables‘ where Dr. Laurie Webster brought out quite a few of the museum’s ‘perishable’ items (made from; wood, bone, animal skin & fur, various fibers, human hair, etc.) to show to the public. A few of the items really stuck with me, and the beaver tail rattle is one of them. Rattles are very rare to find in archaeological site in southeast Utah. 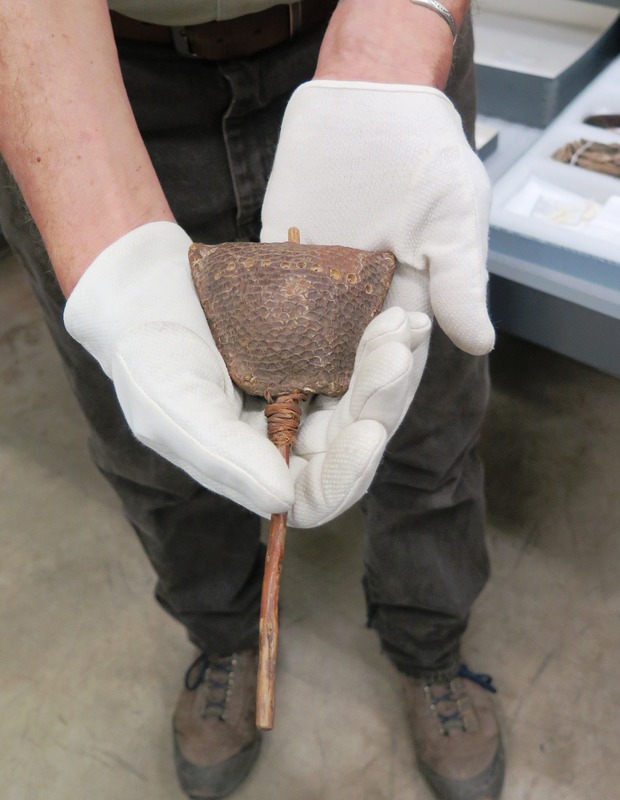 This rattle is made from a beaver tail which was folded over and sewn around a stick and was found in Cottonwood Wash near Bluff. After we had all gotten a good look at it, just before putting it back in the drawer, Jonathan very gently tilted it back and then forward so that we could all hear the rattle. So amazing! 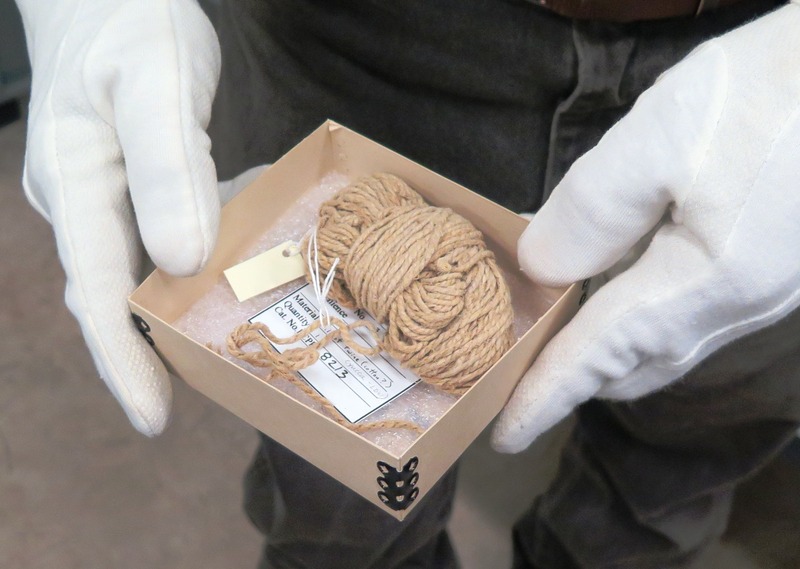 Another item that Jonathan showed us that really stood out to me was the bundle of twine in the photo above. At first glance it may seem very utilitarian and not nearly as impressive as some of the other items we had already seen, but as we were looking at it, it really struck me that something so practical and useful had been preserved all this time. 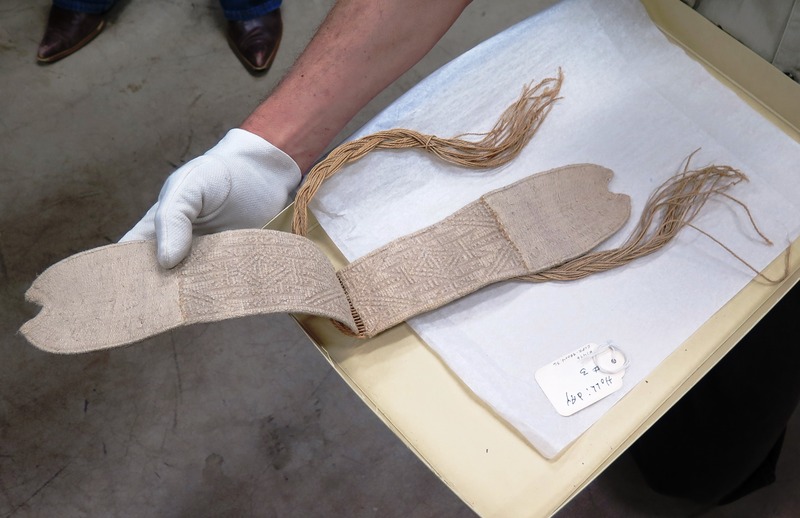 In my mind, this is something that would have been put to use right away, so to see this perfect, seemingly unused, bundle of twine still rolled up as it may have been when it was made, is absolutely amazing to me! We also got to see several different styles of sandals in varying stages of completion and wear. Of course, seeing the pairs that were unfinished makes you wonder why they were never completed. One of the pairs is extremely detailed and it’s obvious that a lot of time went into making them. 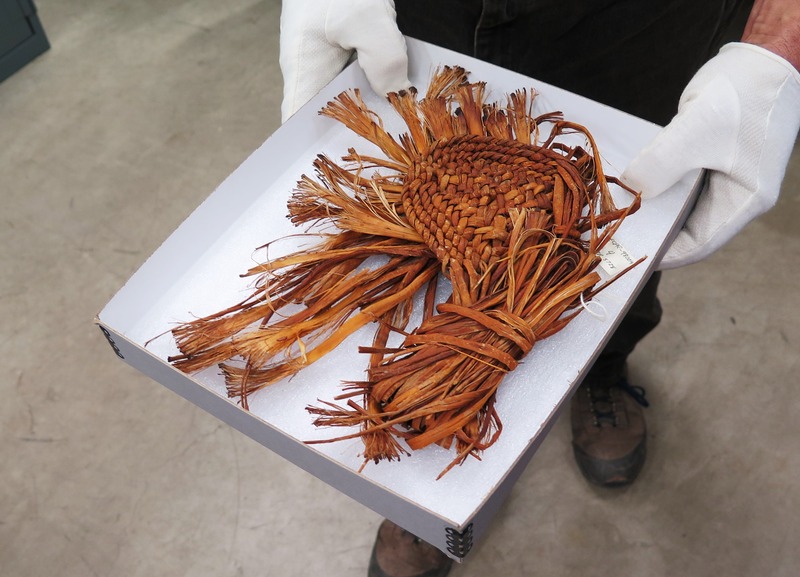 Not only the intricate weaving itself, but the time it took to gather the materials and prepare them for weaving. Some of the other sandals we saw had obviously been worn and used, and may not have been as fancy as the intricately woven, unfinished pair, but to me the fact that they had been worn and are still here for us to see, made them just as impressive to me. 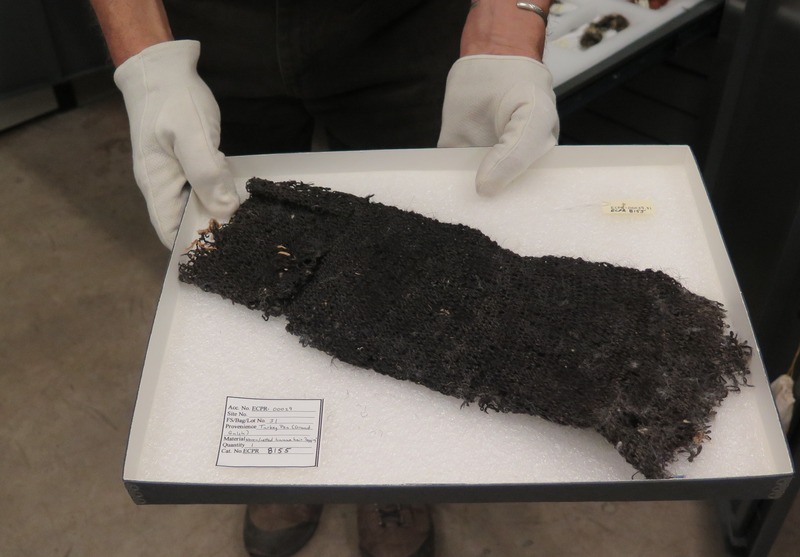 It really is amazing that so many of these artifacts made out of perishable materials have survived hundreds of years, or more. And outdoors, no less! I guess the climate must have to be just right for that to happen, and with the dry climate we have down in this area, it seems that if these items were protected from the elements in caves and alcoves, they had a good chance of surviving! As the tour wrapped up, I was sorry to see it come to an end! From the feedback I received, everyone really enjoyed the it and felt very lucky to have had the opportunity to see such amazing artifacts. Sometimes I think we all get so busy in our daily lives and jobs, even those of us who are involved in the tourism industry sometimes forget what an amazing place we live in. 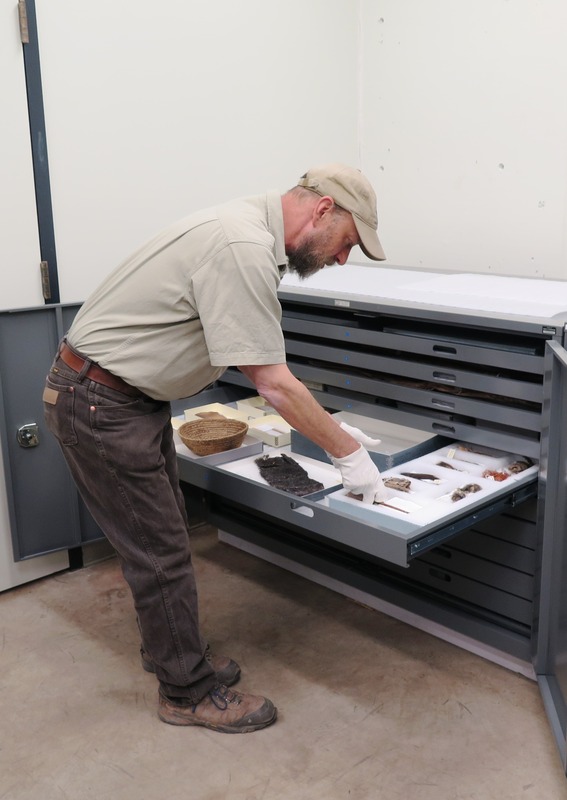 To be able to see all of these artifacts and to know that most of them came from right here in San Juan County, was a really good reminder of what an amazing place we live in! 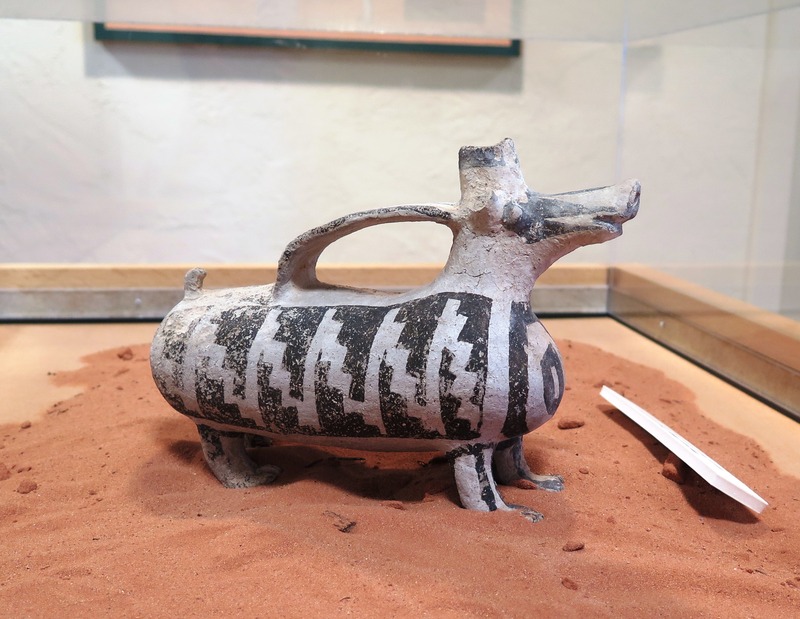 And of course I can never visit Edge of the Cedars without stopping to look at one of my favorite artifacts on display- the animal effigy pitcher in the photo above. This pitcher is part of a display in the main lobby area of the museum that showcases artifacts that were found by hikers, were left in place, and then reported to Edge of the Cedars or the BLM. 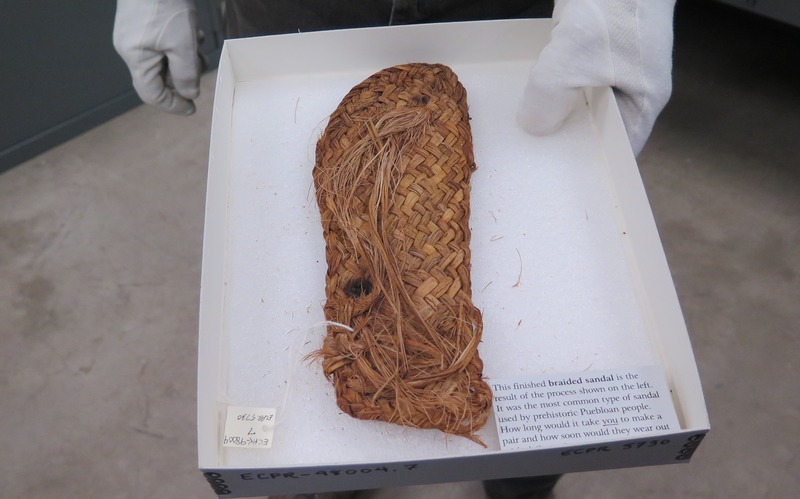 The hikers who found each of the artifacts in this display were then able to return with archaeologists to help with the excavations. 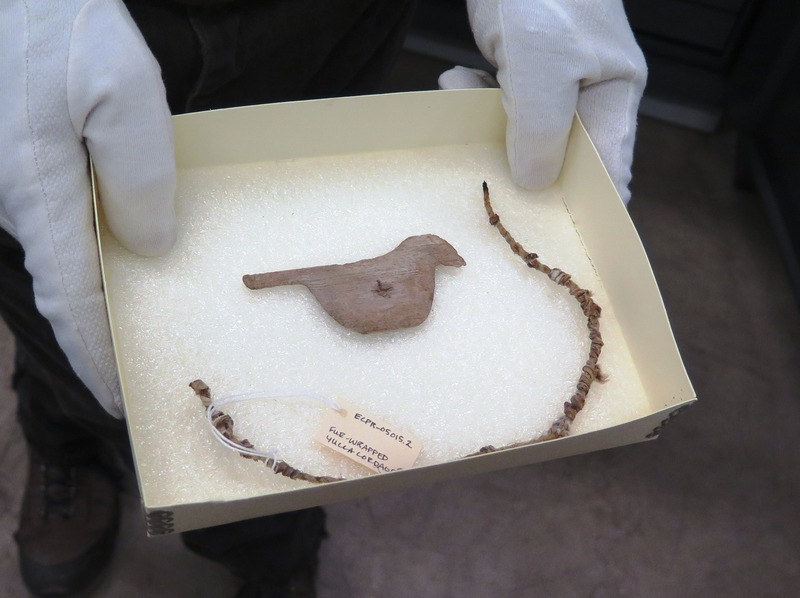 When you visit the museum be sure to stop by and take a look at all the amazing artifacts found by members of the public, and read the stories of their discoveries. This entry was posted in Blanding, Edge of the Cedars, Education Centers, Museums, Off the Beaten Path, State Parks, Things to do with kids, Tours, Tours/Guided Trips, Travel, Utah and tagged Blanding, Edge of the Cedars, Museums, Off the Beaten Path, Things to do with kids, Tours. Bookmark the permalink. This is a wonderful museum. We made our first visit last year. I was so excited to see the original ladder from the Perfect Kiva in Bullet Canyon. That is one of our favorite hikes. What a thrill to see some of the sensitive items that aren’t displayed! Lucky people who got to join you. I wanted to thank you for your direction to the Target Ruin, Ballroom Cave, and Recapture Pocket. We visited all three during our time in Bluff. We found everything you pointed out except the pictographs in the Ballroom Cave area. I searched everywhere…well, I guess not everywhere since I missed them:) I can’t believe you got the kids up to the Cave! We’ll have blog posts coming on these areas soon! Thank you so much for your comment! So glad to hear that you made it out to Target Ruin & Ballroom Cave- aren’t they both amazing places?! I’ll be watching for your blog post!